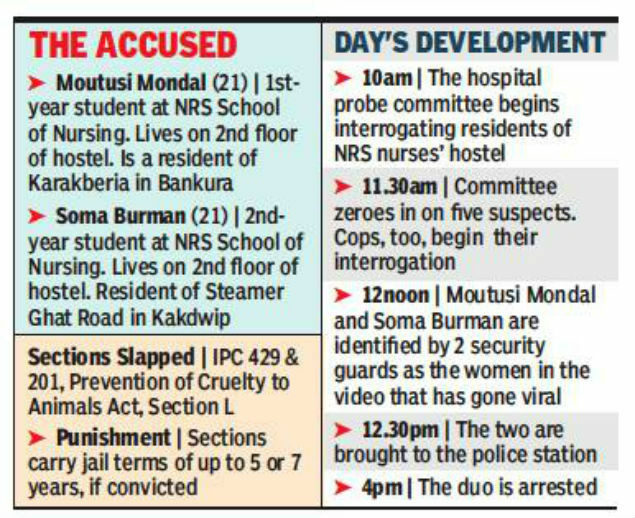 KOLKATA: Police on Tuesday arrested two NRS Medical College and Hospital nursing students for the brutal killing of 16 puppies on the campus on Sunday, with investigators concluding it was a planned murder and not a spur-of-the-moment act. At least three others were also directly involved in the crime and were being questioned, officials added. What has shocked some of the investigators, who have probed several murders and violent crimes in the course of their career, is the type of cooperation and planning that seem to have gone into the “mass murder” of the puppies and the possible involvement of many more hostel residents. The puppies and their mothers were lured into the nursing students’ hostel’s backyard and then corralled inside a compound, with all exits blocked, officials said. According to them, “only two persons would have found it impossible to do all this”. Cops arrested first-year nursing student Moutusi Mondal and Soma Burman, a year senior to Mondal, after several rounds of questioning, first on the hospital campus and then at the police station. Mondal is a resident of Bankur’s Karakberia and Burman’s family stays in Kakdwip. They will be produced at a Sealdah court on Wednesday. “We have arrested the two women on the basis of the widely circulated video and after their identification by two security guards. They have confessed to the act and have also named some others who helped them. We are questioning them now,” a senior Entally police station officer said. The cops have also seized the stick with which the pups were clubbed to death. “It looks like some students and staff nurses had planned the murder. They lured the puppies from different corners of the hostel premises with biscuits and, once they were inside the hostel backyard, all exits were blocked as the two women went about their job for close to an hour. It was coldblooded murder,” a senior hospital official said. The arrests on Tuesday followed the interrogation of around 55 nursing students and staff by a three-member hospital probe committee. Most of them denied having been present at the hospital on Sunday in the face of evidence to the contrary. The probe committee started the interrogation process around 10am on Tuesday with 15 senior staff nurses. “All these nurses lived on the ground floor but all of them tried to evade responsibility; some claimed they were sleeping, some said they were away and others said they were in the washroom. We then interrogated some student residents of the same wing and they, too, tried to protect the women seen in the video. Finally, a security personnel identified the two students who were seen in that 28-second clip,” the official added. Officials, who were intrigued by the reason for such extreme violence, got some “shocking” answers. “The pups would cling to our feet as we walked,” was one answer. Another “crime” was the pups filching some pieces of clothing — left out to dry — and “using them as bedding in winter”. “We were shocked by the reasons that were cited as possible causes for the massacre,” an official said. “One nurse said there were cases of strays biting humans but no one could identify a victim,” he added. Hospital deputy superintendent Dwaipayan Biswas, who led the probe committee, said: “The cops will take necessary action but we are filing a strong report with the authorities, explaining the entire process of how the dogs were killed. Extremely strict action will be taken against the guilty.” Another official said the “strict action” might include rustication.